Kayakers thirsty for thrills and spills could do worse than give white water kayaking a go, and pit themselves against wild river rapids with only a paddle for protection. What is White Water Kayaking? White water kayaking is the sport of paddling down a moving body of water. It is an exciting, challenging and sometimes dangerous experience that at competitive levels requires a high level of technical skill as well as physical fitness, stamina and mental focus. River kayaks are smaller than sea kayaks or open canoes and typically made of tough plastic that is slightly flexible and very durable. There are three main sub divisions of white water kayaking – river running, creeking and playboating. River running is the standard journeying down a river, creeking focuses on paddling particularly difficult and technical rapids, and playboating is the art of performing technical and sometimes gymnastic moves in a kayak. Whitewater refers to the rapids of the river, taking its name from the frothy water that appears when a river’s gradient changes or when there is an unstable current. There is an official international scale of river difficulty that rates whitewaters from a scale of one to six with one referring to very minor rough areas that require no manoeuvring and six being one so hazardous to be virtually unnavigable. Is White Water Kayaking Safe? An activity which derives its excitement and entertainment from the dangers of the white water is always going to attract its fair share of risk. However by kayaking under the guidance of experienced instructors and as part of a group, as well as adhering to the standard safety precautions, the risks are minimised. All kayakers, however skilled, should always know their limits of experience and ability and stay within them – whitewater is not known for giving second chances away too freely. 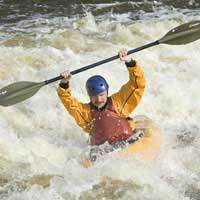 Beginner white water kayakers should not only be reasonably fit and healthy, and confident in the water, but they should be proficient paddlers too. White water kayaking is traditionally seen as being all about throwing oneself, paddle aloft, into the wild adrenaline rush of raging water rapids. There is of course a safe and less forbidding entry point, with beginners typically starting with calm meandering rivers, and then continuing to stick to the level appropriate to their ability. Despite there being calm and easy beginners’ rivers, all novices should nevertheless enrol on an introductory course to get a good grounding in the activity. White water applicants should have first grasped the basics of kayaking on flat water before plunging into learning about riding the rapids. A beginners’ white water course is ideal for those who have experienced the simple laid back joys of touring kayaking and now want to up the tempo. Such a course will typically take a couple of full days and teach the art of running grade 1 and 2 river sections. It should also include subjects like equipment, river safety, paddling and stroke techniques and reading the water. For fast learners there intermediate and advanced stage courses to progress to. Select the class of river according to your skill level. Do not kayak near dams or outlets. Devise an emergency plan of what to do and where to go in case of emergency. If not familiar with the river, ask for advice from a knowledgeable guide or local watersports centre. Plan your route carefully and consider aspects such as weather and river conditions, location of waterfalls and obstacles, entrances and exits of the river and the location and availability of rescue teams.